The latest news reports out of Australia have Prime Minister elect, Kevin Rudd, appointing a former rock singer, Peter Garrett, as Environment Minister. This may not be a surprising move because Peter Garrett is not only known for his bald head and gangly dancing, but he is also known as a social activist. I suppose you could call him "new age". His very popular song about Aboriginal Land Rights (Beds Are Burning) is a case in point. Now Peter Garrett is a Minister in the Federal Government. I'm sure that Peter is delighted with his new-found power. Instead of getting out there and protesting, he can actually do something about the problems he has complained about through his music and the media. The art of popcorn-making is dying. I remember when my father passed on the secret of popcorn-making to me one night. We were standing by the stove and he was shaking the pot over the open oven flame. And the fourth secret, which I am not at liberty to disclose. I was never much good at making popcorn, despite that I know the fourth secret. The last time I tried to make popcorn from corn-kernels over an open flame, I wasted a bag of popcorn and about an hour and a half. There were times, though, that I got it right and the corn popped perfectly. I dubbed myself "The Popcorn King". I seem to have lost the knack and thus the popcorn throne. My shake-the-pot technique has been found wanting - and then there's the fourth thing, which I don't do very well. But I can't tell you what that is. Ever heard of Wierd Al Yankovich? He's a musical satirist. That means that he takes a popular tune and substitutes the original lyrics for his own, more amusing ones. For instance, one of his most famous victims is Michael Jackson's "Beat It" (renamed "Eat It"). One may be forgiven for thinking that the parody is often better than the original, which it often is. Songs have two main parts: the music and the lyrics. As it turns out, the lyrics are secondary, it's the music that's important. You can take the words away from almost any song and you are left with the musical component, which often stands on its own. If you guessed c) or d), you would be wrong, although, during the Cuban Missile Crisis, the janitor did say to Kennedy, "Our goal is not the victory of might, but the vindication of right", while freshening up the toilet bowl. Don't Google Yourself. You May Not Like What You Find. I did a bit of egosurfing (otherwise referred to as vanity searching, egosearching, egogoogling, autogoogling or self-googling). 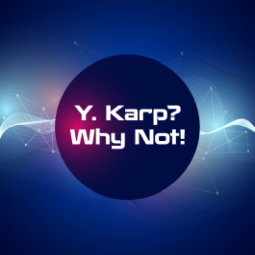 I looked up "Karp" and didn't find much that thrilled me. I then Wikipedia'd myself and found a whole bunch of Karps listed - from punk rock bands to mathematicians. Not that I was expecting an article about me, but I thought that I might find someone with the same family name that did something interesting, something I could relate to. Robert Karp. This was the type of guy I can identify with. Bob lived from 1911 to 1975, but from 1938 to 1974 he was employed by the Walt Disney Company to write the scripts for the Donald Duck newspaper comic strips. Now, there you have it, a man after my own heart - he writes, doodles and gets paid for it. What a perfect job. You are a parent who wants your kid to be a lawyer or a doctor, but they really want to be an accountant or an actuary. You are a coach pushing your team to be the best at their sport, but they just want to run around and get sweaty for fun. That's because you are living your life vicariously through others. I have no problem with that. In fact, I condone and encourage it. Just because you didn't make it in your dream profession or in your dream sport, it doesn't mean that you can't still live the glory. Just because you found yourself sitting behind a desk, day after day, shuffling papers or whatever, it doesn't mean that you can't feel the warm glow of the spotlight of victory on your shoulders, albeit through someone else. I would make a bet that when we were kids we all wished, at some stage or other, that we could be someone special, like Superman, Spiderman or, heaven help us, even Batman. Sometimes those fantasies linger a little bit longer and live in the recesses of our minds during our teenage years, fading away slowly as we approach adulthood. Go down to your local supermarket and take a look around. What is missing? Come on, think. What is it that you have always needed but could never find in your local grocery store? Any ideas? Okay, I'll give it to you: ham or latke flavored soda. Now you are kicking yourself because it was so obvious that you should have guessed it right off. CNN reports that this "holiday season" Jones Soda Co. in the United States is marketing a number of new flavors that have always been missing from the American diet, including ham flavored and latke flavored soda. Both kosher and caffeine free. I don't know about the ham one, but I wonder about the latke flavor. Did the product development team fight about whether it should taste like store-bought, instant or home-made latkes? Also, do you have to drink through a thick layer of oil before reaching the actual soda? That could really put a damper on the fizz. To me, there is nothing like sitting on the couch with a nice big, hot cup of coffee and a newspaper. It's a mystery to me, but for some reason it can be very relaxing to be able to sip a steaming cuppa and read the news: usually morbid stuff like how many people died in what tragedy in which part of the world. I remember that when I used to have a TV at home I would watch the news as a form of entertainment. Sure, I rationalized that I was "informing myself" about world events. But, get real, it was enjoyable to sit and munch on a cheese-topped cracker and listen to the newscasters report on things that only happen to other people. I think that the point of scientific, theory, conjecture and experimentation is for our entertainment pleasure. I can just see all the white-coated scientists with their rotten tomatoes at the ready, aiming for my good typing hand. How dare I minimise the importance of scientific wisdom! Think of all of the good that science has brought to the world! In one line I reduced to mockery millennia of effort and thought. Entertainment, indeed! In the hope of causing a ruckus, I am prepared to defend my viewpoint - feel free to disagree. Take a look at this website. It lists the top 20 most bizarre scientific experiments of all time (note that they are only the top 20. This implies there are more!) Some of them are truly revolting, others are interesting and the rest are amusing. But they are all entertaining. I mean, reading them is fun. Science = Entertainment. According to this Wikipedia article, in Nordic countries, only government-run vendors can sell alcohol because the government wants to crack down on alcohol consumption in countries where "binge drinking is an ancient tradition". Nice one.